This assumes a multi-level water loss (Class 3 | Cat 1). The cause of loss was a supply line located under the sink in the upstairs bathroom. The policyholder noticed the water dripping from the ceiling downstairs and subsequently engaged a restoration contractor within an hour of the initial supply line failure. The quick response times created an opportunity to deploy performance drying equipment in an effort to dry much of the affected building material in place. Ultimately the performance drying was successful in its efforts to mitigate additional damages and manage the overarching claim cost (this approach delivered a substantial reduction in the scope and cost associated with the repair phase). Remote monitoring was utilized in an effort to help facilitate this and mitigate the potential for over-drying. 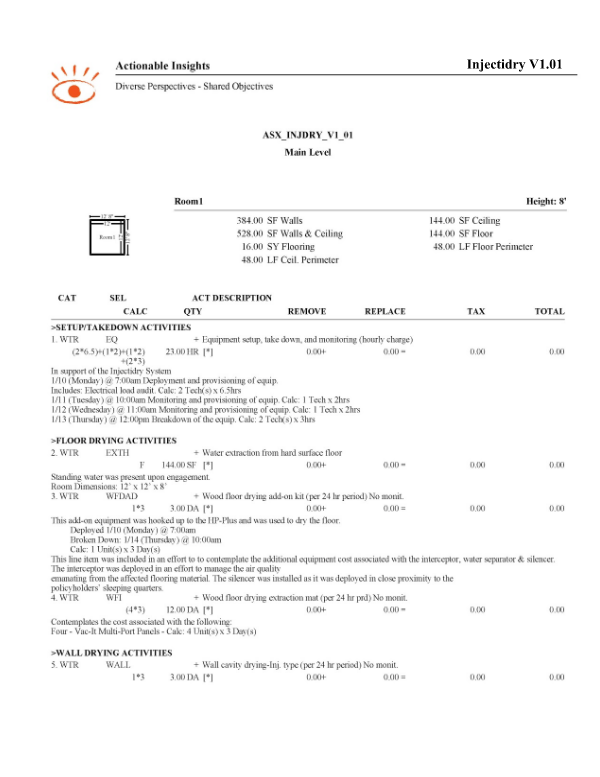 This Insight Sheet exists to clarify how one might invoice for an Injectidry System. This does not seek to include or make concessions for all equipment and/or activities as it relates to a loss of this nature. "Ultimately the performance drying performed by the restorer mitigated additional damages and helped reduce the claims loss experience". 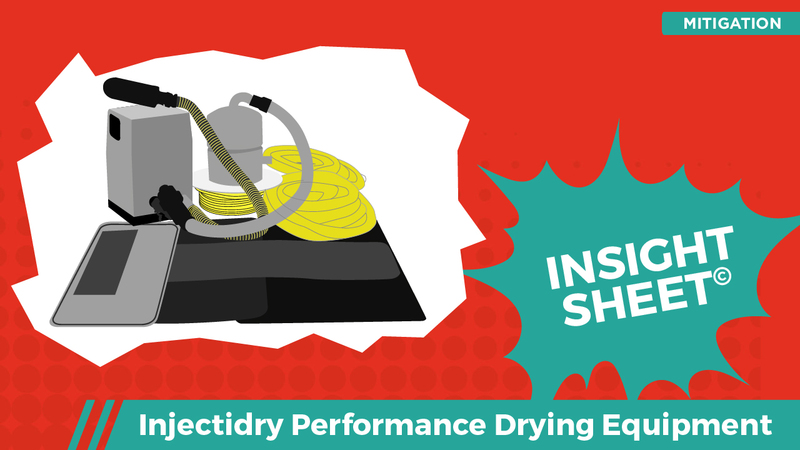 This Insight Sheet exists to clarify how one might invoice for an Injectidry HP drying system. As reads: "...deployment of sensitive specialty equipment".... Suggest "sensitive high pressure equipment". The word "specialty" is no longer applicable as it has become a component of the current Standard of Care practiced by a competent restorer. It also makes adjusters want the contractors to "wait for permission" to deploy taking time and opportunity away from the contractor who is skilled in the art, which adjusters ARE NOT. Suggest: "Standing water was extracted prior do deploying an HP 60 or PLUS" along with appropriately placed Vac-It Panels". "The HP-60 or PLUS work with 1-10+ drying Panels depending on floor type and condition. The equipment can support from 100 to 350 sq ft with finished in place flooring. Beveled or micro-beveled floors will be on the order of 100 sq. ft and finished in place floors up to 350 sq ft."
"If contractor is not able to document at a minimum 5" WC vacuum, more kits or base units should be added". My comment is that vacuum pressure measured with a manometer at a remote panel will dictate whether 1 base unit will be needed, not the quantity of panels. 5 to 55" is a range which is required. Five (5) WC" equals 255 "pounds" of upward force. That is enough to dry by forcing air to move beneath the flutes and through the tongue and groove. Looking at line item #4 it seems like the entire Injectidry system is getting charged 4 times for 3 days... Reading the Xactimate description, "Includes: Equipment charge for extraction mat type floor drying system (including blower, hoses, mats, etc.)." it seems the unit and all hoses and mats are already included in that line item and should not be duplicated per mat... Am I wrong? Please let me know if I am missing something on this? Hey Jeremy! We are actual in the process of refining this Insight Sheet after meeting with the Injectidry team. This equipment is super unique and we are working with the Xact Pricing Department to add/refine line items to reflect the efficiency and effectiveness of Injectidry's equipment. Wonderful! Thanks for the update. I look forward to seeing the revision once it is posted. Injectidry products are really taking off here in Texas. Adjuster’s requesting.